John Perry did two things on his 75th birthday. First, he visited his wife's grave. Then he joined the army. The good news is that humanity finally made it into interstellar space. The bad news is that planets fit to live on are scarce - and alien races willing to fight us for them are common. So, we fight, to defend Earth and to stake our own claim to planetary real estate. Far from Earth, the war has been going on for decades: brutal, bloody, unyielding. Ensign Andrew Dahl has just been assigned to the Universal Union Capital Ship Intrepid, flagship of the Universal Union since the year 2456. Life couldn’t be better…until Andrew begins to pick up on the facts that (1) every Away Mission involves some kind of lethal confrontation with alien forces; (2) the ship’s captain, its chief science officer, and the handsome Lieutenant Kerensky always survive these confrontations; and (3) at least one low-ranked crew member is, sadly, always killed. Disappointing, but somehow still worth a listen. A human diplomat creates an interstellar incident when he kills an alien diplomat in a most unusual way. 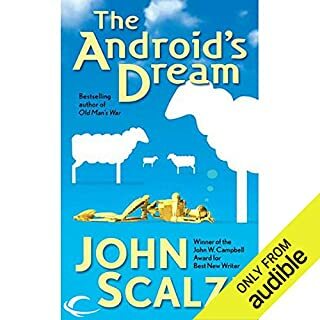 To avoid war, Earth's government must find an equally unusual object: A type of sheep ("The Android's Dream"), used in the alien race's coronation ceremony. To find the sheep, the government turns to Harry Creek, ex-cop, war hero and hacker extraordinaire. Short, sweet, and satisfying storytelling. Colonial Union Ambassador Ode Abumwe and her team are used to life on the lower end of the diplomatic ladder. But when a high-profile diplomat goes missing, Abumwe and her team are last minute replacements on a mission critical to the Colonial Union’s future. As the team works to pull off their task, CDF Lieutenant Harry Wilson discovers there’s more to the story of the missing diplomats than anyone expected... a secret that could spell war for humanity. The space-faring Yherajk have come to Earth to meet us and to begin humanity's first interstellar friendship. There's just one problem: They're hideously ugly and they smell like rotting fish. So getting humanity's trust is a challenge. The Yherajk need someone who can help them close the deal. Enter Thomas Stein, who knows something about closing deals. He's one of Hollywood's hottest young agents. In Rip-Off!, 13 of today’s best and most honored writers of speculative fiction face a challenge even they would be hard-pressed to conceive: Pick your favorite opening line from a classic piece of fiction (or even non-fiction) - then use it as the first sentence of an entirely original short story. When is a rip-off not a rip-off? The Ghost Brigades are the Special Forces of the Colonial Defense Forces, elite troops created from the DNA of the dead and turned into the perfect soldiers for the CDF's toughest operations. They're young, they're fast and strong, and they're totally without normal human qualms. For the universe is a dangerous place for humanity - and it's about to become far more dangerous. Three races that humans have clashed with before have allied to halt our expansion into space. Their linchpin: the turncoat military scientist Charles Boutin, who knows the CDF's biggest military secrets. To prevail, the CDF most find out why Boutin did what he did. Jared Dirac is the only human who can provide answers - a superhuman hybrid, created from Boutin's DNA, whose brain is uniquely able to access Boutin's electronic memories. But when the memory transplant appears to fail, Jared is given over to the Ghost Brigades. Jared begins as one of these perfect soldiers, but as memories begin to surface, he begins to intuit the reason's for Boutin's betrayal. As Jared desperately hunts for his "father", he must also come to grips with his own choices. Time is running out: the alliance is preparing its offensive, and some of them plan worse things than humanity's mere military defeat. Starts slow but comes together in the end. The Ghost Brigades is the second book in the Old Man’s War series and although it is a relatively stand-alone story the first book provides some necessary background context and I recommend you read it first. In book 1 the main character is CDF soldier John Perry and the Special Forces play a secondary role, but in this book the Special Forces take over the main storyline and there are just a few occasional references to John Perry. Jane Sagan returns from the first book and provides some continuity for a host of new characters, including Special Forces solider Jared Dirac. The story starts off in a disjointed way as events occur without much explanation as to why they matter, but then it all comes together in the end to set the stage for Jared to make some interesting moral choices. 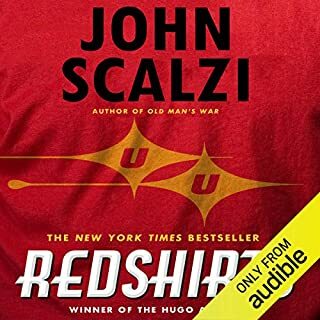 Scalzi reveals a lot more about the various non-human races and gives a glimpse into the galactic politics faced by humanity. As the actions of the CDF on this grand stage are slowly revealed to him, Jared has to sort out the truth from the half-truth and decide if the CDF that created him is good or bad for human-kind. Does he have an obligation to protect humanity as he was bred to do or is he just a disposable slave being used to move forward a hidden CDF agenda? Although the book can be predictable at times it is still enjoyable science fiction and reveals just enough about the bigger picture to encourage you to move on to the next book in the series which I plan to do. William Dufris does a decent job as narrator even if though he is forced to utter “he said” “she said” a few too many times. If you enjoyed the first book then you can confidently spend a credit to give this one a listen. This is a nice followup to Old Man's War. Scalzi again creates a great ride, that is deeply enjoyable and with great characters. It helps to have read Old Man's War, but you could pick this one up and start here. This story takes place a few years after the events in Old Man's War. Jane Sagan is a Lt in the Ghost Brigades and assigned to the Kite. She uncovers a plot against the Colonial Union, and that there is a traitor helping out the enemies plotting against the Union. Most of the story follows the rather unusual method they use to track down the traitor... Very well written, held my attention throughout. We were really looking forward to The Ghost Brigades after reading (and loving) Old Man's War, but this novel turned out to be somewhat of a disappointment for both of us. In all fairness, the last 50% of the novel was closer to four stars, but still lacked the emotional connection and fluidity that was present in the prior book. I agree with my husband that the switch to third person perspective contributed to the problem, but my biggest issue was long narrative tangents about "how things work", i.e., weapons, consciousness transfers, etc. Sure, we need to know enough about these things to make it interesting, but for the love of all that is good and holy SHOW ME! Don't just explain it in boring detail! The book is split into two parts and the first part (about 48% of the book) took me back to sixth grade when I had a substitute teacher for a week. She read out of our text books...all day long. I think you get the picture. When the action did finally pick up and we get to see the Ghost Brigade in action, it was brutal. No doubt it was extremely well written, but...ARGH! My heart! No spoilers here, but those that have read the book will know about the mission at the Eneshan Palace. While it nearly killed me to listen to the Eneshan Hierarch's desperate pleas, I can't ignore that it was an exceptional piece of writing. The audio version brought me to tears. Huge kudos to narrator, William Dufris. It's obvious that Scalzi has amazing talent here. I just wish I had felt this sort of connection with Jared, Sarah, Jane, and many other characters. 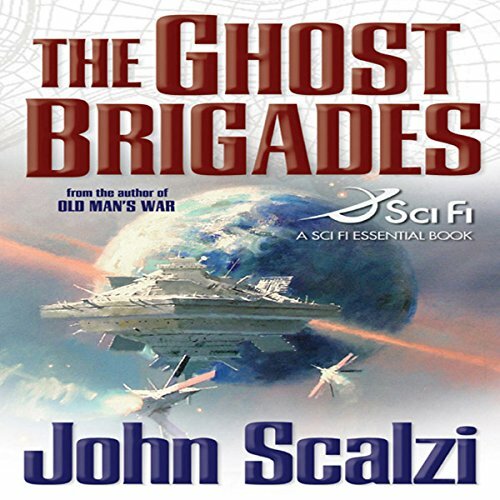 In this one heart wrenching scene, Scalzi makes it known that the Ghost Brigade is not the regular military. They are the covert ops of the galaxy, unknown to all but the most elite military leaders. Which is pretty cool, but I still wasn't sure where the "big" story was going. Wasn't this supposed to be about Jared having another man's consciousness in his head? What happened to Charles Boutin anyway? Part two finally gets the story back on track and we both enjoyed the book so much more from this point forward. Overall, it was an okay read. We didn't love it, but it wasn't awful. We will continue the series as we are very excited to catch up with John Perry. He was a fantastic character from the first book! If you liked OMW, then you'll like The Ghost Brigades. It's fast paced sci-fi military action with a mystery element. The protagonist is compelling & sympathetic. Some characters from OMW also play an important part. This, the second novel in the series, suffers from a number of flaws that make it a difficult audiobook to get lost in. "Old Man's War" walked the reader through alongside the protagonist while he discovered a strange universe. In this book everything is told to the reader directly, not revealed. Recapped in painful detail for anyone who read the first novel. The main character is not particularly engaing, and characters stand around monolgueing like villians in a Bond film. I could not finish it. The phrase "special forces soldier" is repeated a million times, and must die. A fun listen and worthy successor to "Old Man's War". Scalzi writes his books with a very Heinlein'esque feel...in a good way. This novel is down to earth, to paraphrase a trite and incorrect saying I guess, shoot 'em up Si Fi. I agree with other reviewers, though, and think I'd rather have read this novel instead of listening to it. Some authors,who do an excellent job of writing tight dialogue as Scalzi does, use "He said", " She said' a lot. A lot... A lot.... It gets redundant and a bit tiresome to listen to but isn't bad when it's being read...Lee Child's Jack Reacher books are the same way. However, as I did download the book, I continued to listen and finally got accustomed to the redundancy as annoying as it could become. 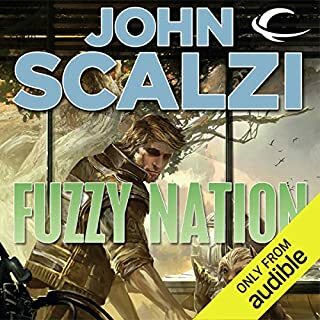 I know this is the terse way Scalzi writes and I enjoy hearing William Dufris narration during the exciting parts sufficiently that it's worth listening. Neither of the protagonists from "Old Mans War" follow us into "The Ghost Brigades" and it took a bit of a getting used to for me but I quickly grew to appreciate the new character, who was as well developed a character as John Perry over the books length and who I really connected with. A new secondary character is introduced as a child in the end of this book, Zoe, who becomes important in the winding up of the series. The book becomes quite complicated as regards who is related to who about 2/3 of the way thru the book and it's important to keep things straight. If you can. I also really really like the way Scalzi writes the characters of his aliens. They aren't faux humans but instead are actually alien in thought, mental processes, culture and looks as any alien I've read previously. It's simply superb and I admire the individual books and the development of the series. I think I'm going to be sad to have it end-and have already bought the last 3 books. And about those books. The ending of "The Ghost Brigades" is an ideal place to listen to Scalzi's hour long short story, ""The Sagan Diary". This was written after the series was finished to fulfill an obligation and fleshes out the character Jane Sagan, who is reintroduced in "The Last Colony" , is written from the female first person point of view and, IMO, is one of Scazis best pieces of writing. He does a fantastic job of interpretation a woman's deepest thoughts as she writes her diary, including a slightly steamy sexual chapter. Not to be missed. John Scalzi..your writing is really beginning to grow and I hope you have years of excellent work ahead of you. 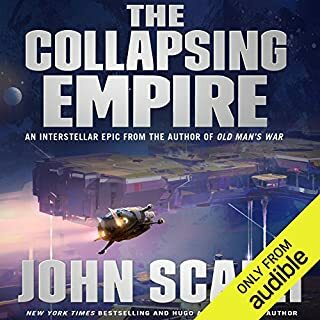 John Scalzi's style of writing does not make a good audio book. Every sentence starts with or ends with 'he said' or 'she said'. To the point where I dreaded conversations. 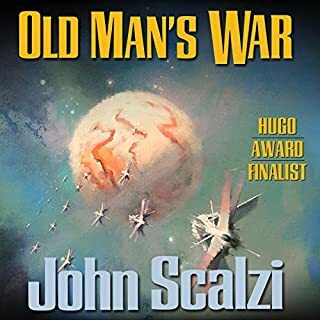 Scalzi's science fiction world is a bit derivative, but this and Old Man's War are entertaining reads that contain enough moral dilemmas to be interesting, but don't take themselves too seriously. Picture a more tongue-in-cheek version of Starship Troopers or Ender's Game. 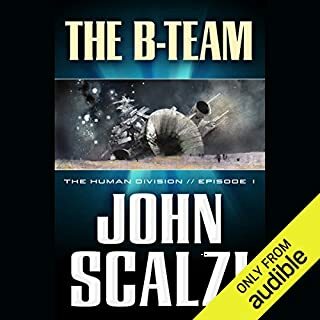 Scalzi's special forces soldiers, born into adult bodies with preprogrammed, networked minds, are intriguing characters, and the scenes in which Scalzi examines their childlike personalities are both humorous and surprisingly touching. Other times, the story devolves into a straight shoot-em-up with cliched dialogue and inane science, but the author does use plot effectively and got me involved in the characters enough to keep turning the pages. Had a little harder time finishing it. I'm optimistic book 3 will be better though. Get John Perry back in action I believe.